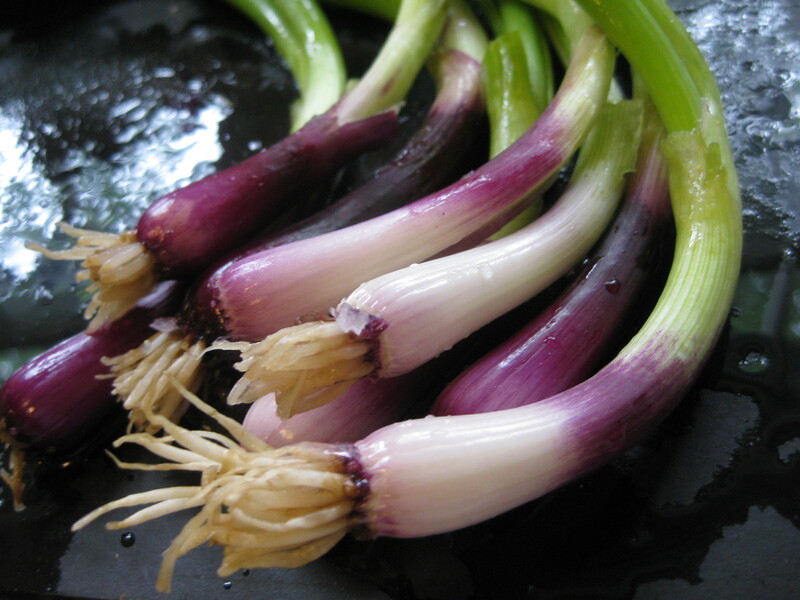 About a month ago, just as spring onions were starting to bulb, I picked up several bunches of scallion-like specimens with violet flesh, which were being discarded in our local organic produce market. While the green ends were somewhat compromised, nothing was wrong with the bulb end. Pickled in a simple solution of vinegar and sugar (light on the sugar), they’ve been curing in my fridge for a few weeks. I deliberately kept the sugar content low, thinking I’d serve them as a condiment with some undetermined entrée. 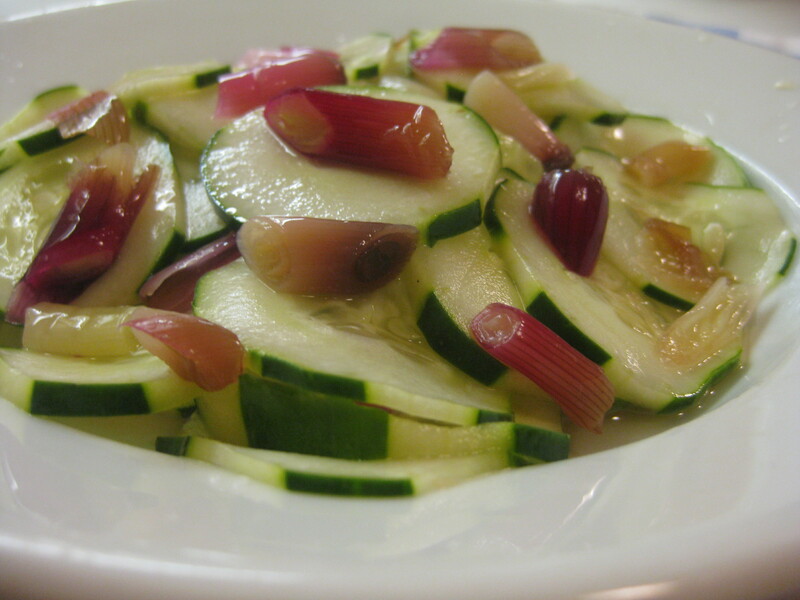 Instead, I sliced them and used both the onions and the pickling liquid in a fresh cucumber salad. In retrospect, I would boost the sugar (which I did in this recipe) and use white vinegar rather than white wine vinegar. These little guys were so beautiful that I’ll have to repeat this experiment, maybe with their older relatives, the bunching onion. Trim enough onions to fit comfortably into a jar with a tight fitting lid. Bring the remaining ingredients, other then the herbs, to a boil and add the trimmed onions. Bring the liquid back to a boil and cook about 1-2 minutes, until the onions are slightly soft but still firm. 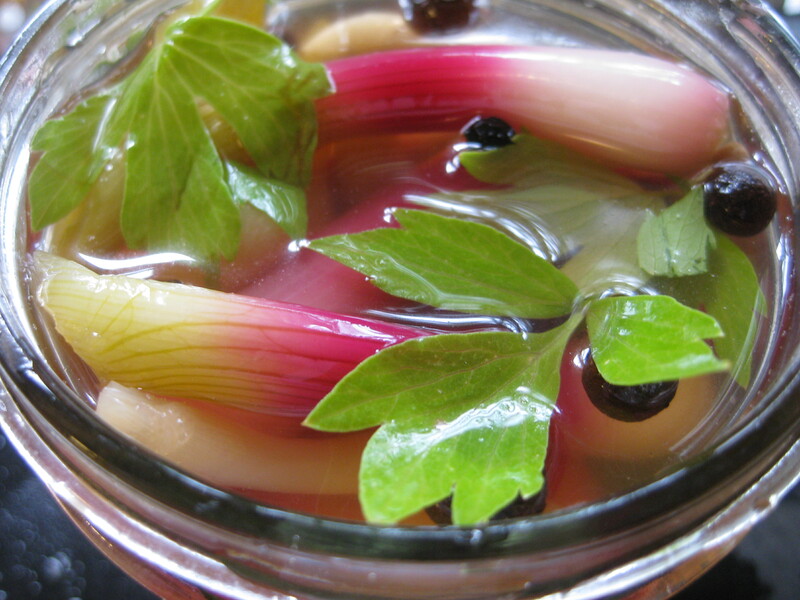 Place the onions in the jar, add the herbs, and pour over the pickling liquid. When cool, cap the jar and place in the refrigerator to cure for at least a week.